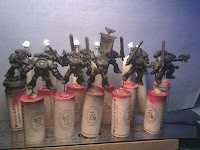 Ok, 1/4 of my troops done! My third tactical squad, Eremiel, is now done. 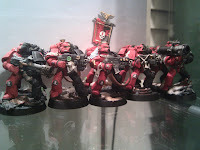 So that makes all my legal and good to go Tac squads painted, based, and sealed I will begin working on my first (non-JP) assault squad, Uriel this week. So, as far as my painting progress, steady as she goes...But what about all the new little thingies to start painting, arms, Jet Packs, heads? 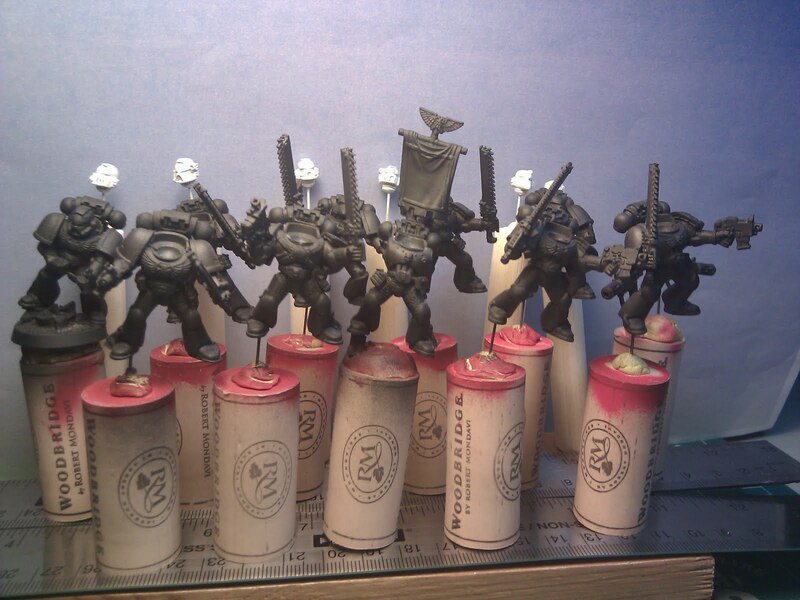 My next set of marines are about to begin, but I need to work out a few magnetizing and painting station solutions. Squad Uriel Ready to go! In working with my Tac Squads, my current setup is akin to a post over at the Jungle, Massive Voodoo, found here. 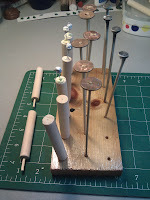 I use Wine Corks with magnets on the bottom, magnetized onto a ruler or metal roofing straps. This works well for the complete and off-the-base models, but now I am going to be working with arms, jet packs, and heads off the main body. 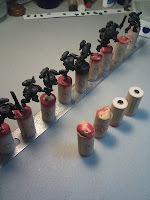 Here is the Cork and Magnet Idea from Massive Voodoo in action, as I painted all three of my squads and the main marine bodies, Pewter and Plastic. 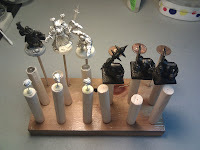 To work with smaller pieces, I adapted my old idea of "magnet on a stick" for my 6 rank regiments of OnG, and used something a little more beefy. Here is an example of my previous incarnations of "holda-ma-jingy" attempts. The Magnet on a stick idea works well, but isn't very durable, so hopefully my new setup will work better, with a beefier dowel. Here is Some examples of my older, less stable On a Stick setup. 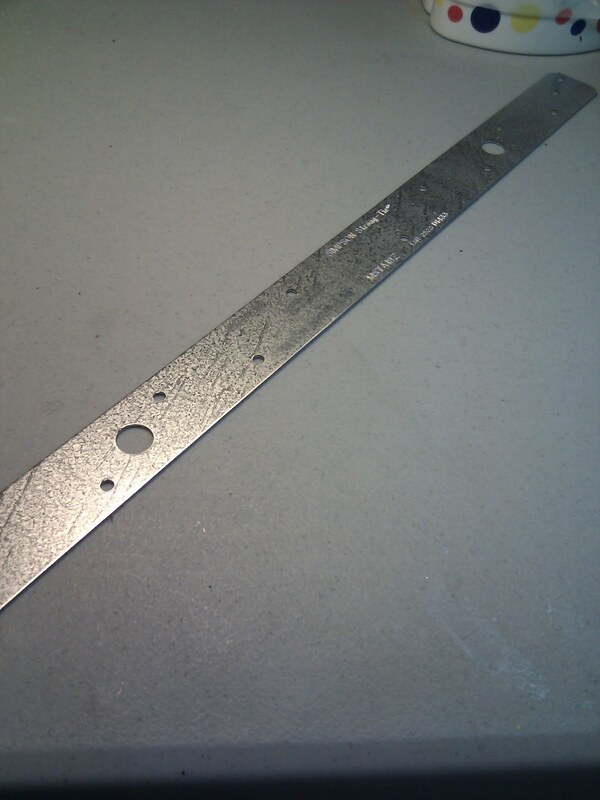 Now as you may see (above), I have 10 extra rods with a pinhole drilled in the top to accept pins for my heads or jet packs, secured with Poster Tac. 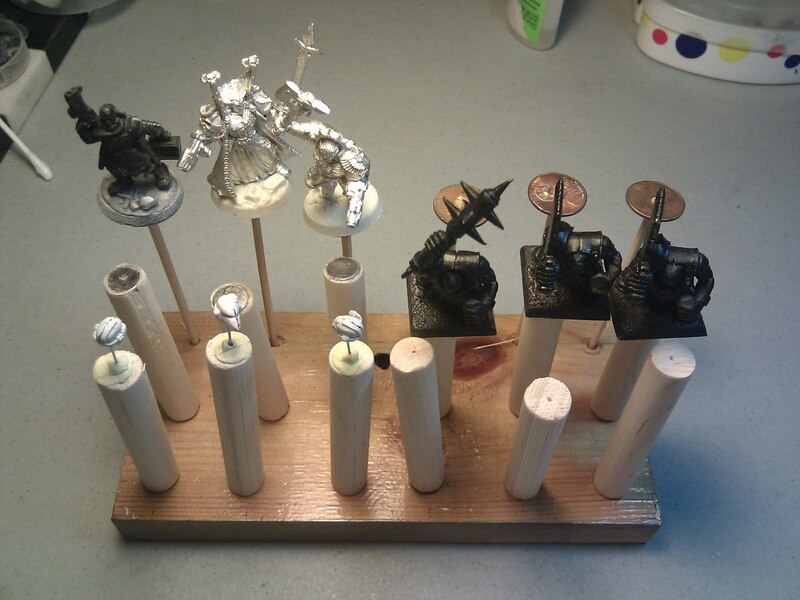 The pennies I skewered are good fastening points for 25mm bases with Poster Tac. 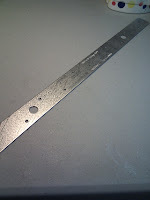 Magnetized for (metal bottomed) magnetic fantasy bases. 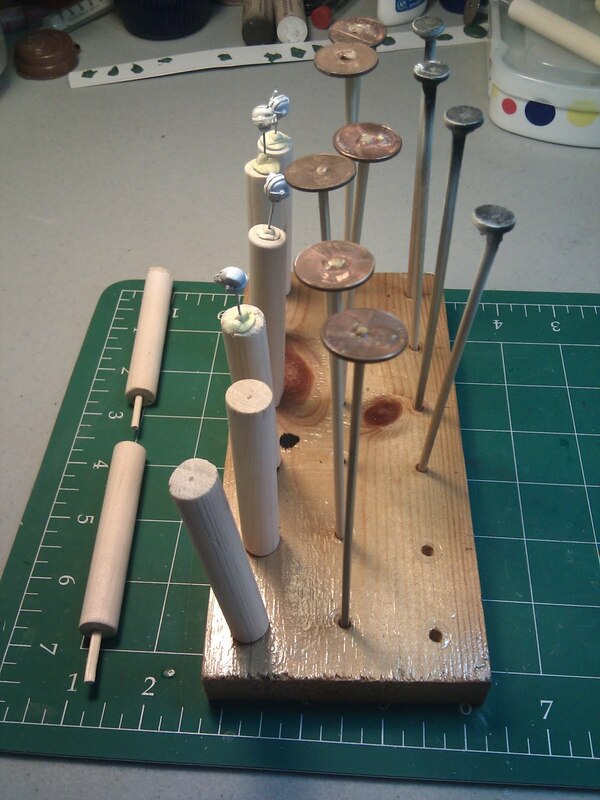 Pin holder, for heads, Jet packs, arms, etc. 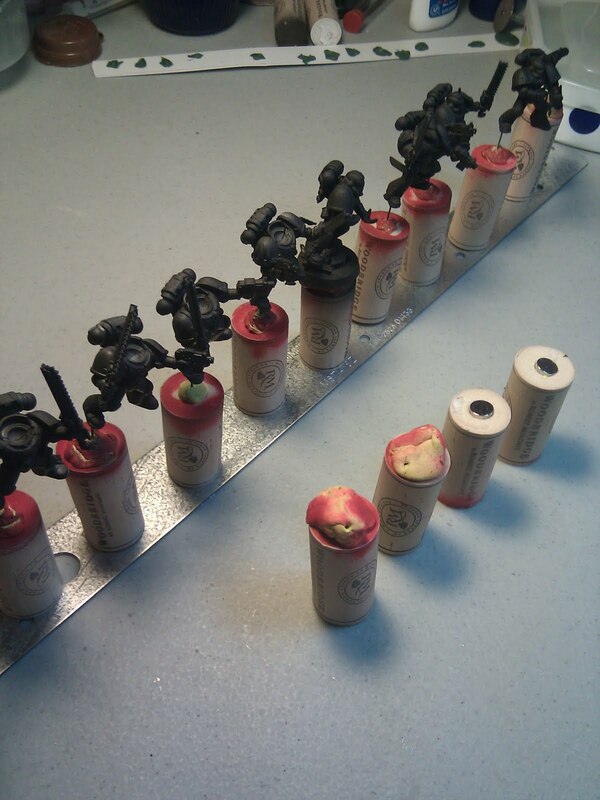 So hopefully, this new set of holders will get me through my multi part marines with ease and clean efficiency. Feel free to comment with your ideas and solutions!